Are Smart Homes a Real Estate Game Changer? Learn about the latest in traditional and digital marketing. Smart home technology has been around for several years, and recently the industry has seen tremendous growth. This tech allows remote control of home features such as lights, energy, sound, and security. And it’s getting more popular: according to Coldwell Banker’s 2018 smart home survey, 32% of Americans want smart home tech, up 24% from last year. As demand for smart home technology increases, will it change the real estate game? The smart home tech industry is booming in large part because of the tablet and app market. People are used to controlling all their information through a handful of apps, so it’s no wonder they’re coming to expect the same level of control and accessibility for their homes. The market may also be driven by increased energy and security consciousness. Popular smart home tech includes Nest thermostats, Phillips Hue lighting, and the A.I. hub Amazon Alexa. Even with a hub most home owners don’t have a fully integrated system, so their home features are controlled by 3-5 apps or a conglomerate app like Yonomi or Smartthings. This is a divide in the market: there are all in one smart home designs, and separates. The all-in-one systems are known as custom electric design and installation, and the trade association is CEDIA. Regardless of whether the system is all-in-one, hubs are the current trend in smart home tech. Hubs integrate all of most of the technology into one place, and only have one remote or control center app. The all-in-one designs are more powerful, but also more expensive. The most popular features are reducing energy usage and managing security. 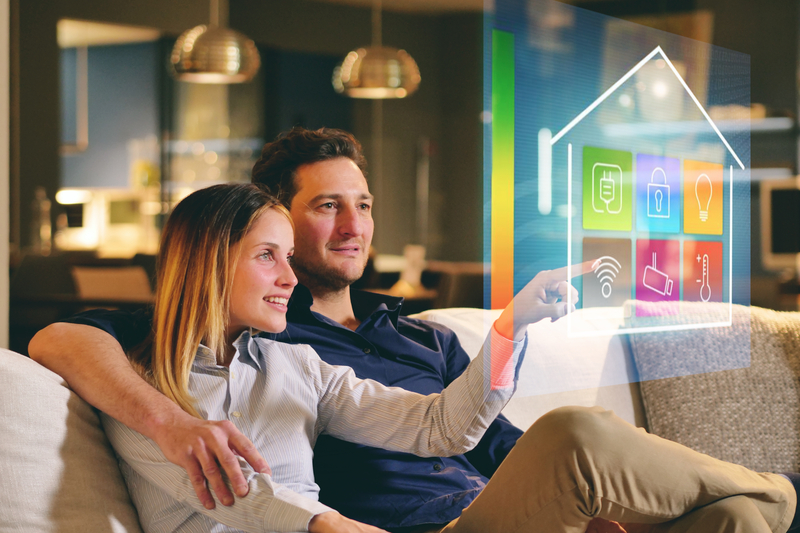 Can smart home tech add value to your property? Currently, installing smart home features is not likely to increase the value of a home, but it might increase the speed of sale. This tech does appeal to buyers, especially smart thermostats, smoke detectors, and security devices. It’s like adding a fresh coat of paint, not a half bath. Appraisers are not likely to take smart features into consideration, especially because they may not be permanent. At the same time, having smart home features could make the property stand out from others, or help close a sale quickly. The difference might not be in the asking price, but smart home tech still makes a favorable impression. Smart home technology can make great selling points, if you knows your stuff. Tech like smart thermostats, smoke detectors, and energy management can save the owner money down the line. There is also a quality of life angle that you can work in. It’s worth noting that security concerns are common with smart technology — people don’t want their information getting out. Make sure that you know enough about the smart features to sell them well. If you are using smart home tech to spruce up a home for sale, you can do so for a relatively small investment. This Consumer Reports article shows how you can install the most popular smart home features for about 1K. Overall, smart home technology isn’t going to make a huge difference in a house’s selling price. However, it’s likely that we’ll see more smart home technology in middle-class houses, increasing demand, and more understanding of this technology in the coming years.